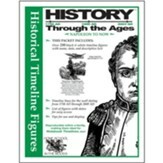 Create your own lapbook, teach a new unit study, or help your students visualize the scope of history with Homeschool in the Woods' homeschool history supplements. 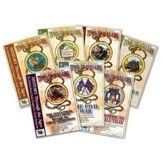 Create your own lapbook, supplement your unit studies, and bring some more life into your textbook studies with Homeschool in the Woods' complete collection of seven Time Travelers History Study CD-ROMs! 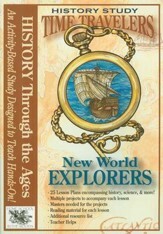 Covering the New World Explorers through the end of World War II, your children will discover the powerful events and people of Western history through hands-on projects, experiences, and more. The CDs includes each lesson text pages, project overview pages, and a wide variety of masters for projects. Photos and drawings help illustrate the directions for completing over many activities; choose the projects that work best for your family! "Project Days" are also built into the schedules to help allow for extra time to complete outstanding projects. Teacher helps, resource lists, teacher keys, and "guide-at-a-glance" pages are also included. One-page guides will allow the teacher to see the whole schedule of upcoming topics and projects on one page. 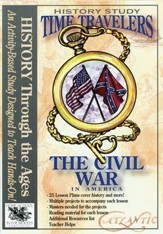 Tastefully laid out for inclusion in your three-ring binder, these unit studies will give both the teacher and students a thorough, exciting adventure into the past! 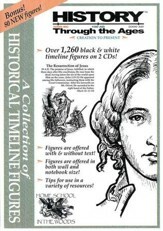 Help your students visualize the entire scope of history with three bestselling timeline resources from Homeschool in the Woods! 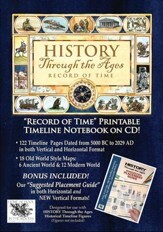 Interact with history when you compile your own timeline notebook with Homeschool in the Woods' History Through the Ages Record of Time resource. A handsome hardcover book with inside spiral binding, this book includes lined and dated pages from 5000 BC to 2500 in ten-year increments. 17 detailed map blanks are provided. Pages are printed on rich ivory paper with stylized fonts, for keepsake quality. 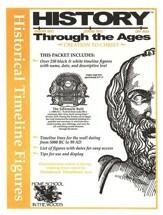 The History Through the Ages CD-ROM Set Creation to Present provides an easy-to-do project that allows you to see all history at a glance, helping the most visual of learners grasp the abstract idea of "time." 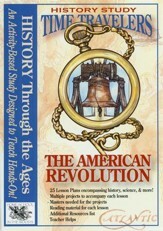 CD 1 includes PDF pages of all the figures in the History Through the Ages Timelines sets ("Creation to Christ," "Resurrection to Revolution," "Napoleon to Now," and "America's History") and CD2 includes more than 1,260 timeline images as well as 30 helpful categories in chronological and alphabetical order for topical studies. With over 1,260 images to place, you might feel like you need some helping ensuring that they all fit! The Suggested Placement Guide will help you to determine how many images fill a page in the future, allowing children to see where to align the figures, add their own notes, additions and more. CD is Windows and Macintosh Compatible. Acrobat Reader Required. 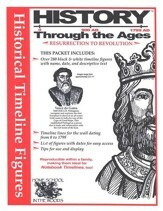 This printable timeline contains PDFs of 122 pages of dates ranging from 5000BC to 2029 AD designed to contain the “History Through the Ages Historical Timeline Figures” (not-included; sold-separately). Each page contains faint background lines to keep written notations neat and help keep figures aligned. Over 60 inspiring quotes are also integrated throughout. Pages are offered in both horizontal and vertical formats. The suggested placement guide contains both horizontal and vertical placement suggestions as well; it will help you preview how many images will fit on a page, and help you determine where to align figures and where to include notations. Olde World Style Maps are a resource that will aid in teaching your students the "where" in history! These beautifully hand-illustrated black-and-white maps help by offering your child a hands-on experience with the rich look of centuries past. 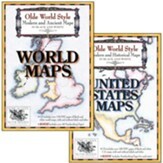 The World Maps set offers maps in Ancient and Modern styles! Determine locations of countries, cities, landforms, rivers, and bodies of water in relation to the world around them! Maps are offered in a variety of ways, such as with and without labels, with and without particular borders, and with a blank title frame for you to fill in for specific projects! Create your own title such as the Crusades, The Silk Route, Barbarian Invasions, weather patterns, and much more! 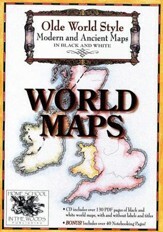 Modern maps contain political lines while the ancient maps are presented in physical map format. 40 Notebooking pages to enhance your studies are also included. Black line pages include various report forms, fact sheets, and creative ways to record information from your research. In addition there are flags and graphic icons of the countries to print in full color and place on your fact sheet. 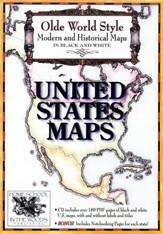 The United States Maps set contains maps of each state, Washington DC, and over a dozen maps of American History. The state maps are offered three ways for your convenience: with labels, without labels, and in outline form. Use the labeled version for simply coloring, or have your student do their own labeling! Or, get more specific by designating areas of agriculture, locations of historic landmarks, displaying reservations, and much more! Also included are over a dozen maps pertaining to the growth and changes of the Nation. From the location of various Native Tribes to the 13 Colonies, and through the expansion of the states, these maps will offer additional helps when studying America's history. Fact sheets for each state that can be filled out and colored in are also provided, along with teacher keys and a set of full-color state flags. 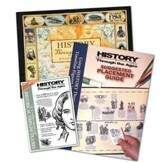 Bring excitement and energy to your history class with hands-on learning! This study from Homeschool in the Woods includes a "Guide Book Text" to read, a "travel itinerary" of project directions, and over 25 "stops" with over 50 projects and activities (with masters for printable projects). Scattered throughout the journey are dramatized MP3 audio tours. 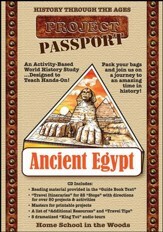 "Travel Tips," resource lists, teacher keys, and a "quick stop itinerary" overview are all included on one CD-ROM. 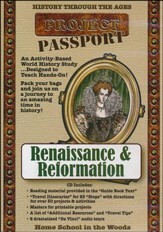 Activity-Pak CD-ROMs are loaded with lapbooking projects that incorporate creative writing, coloring, research, Bible study, and more. 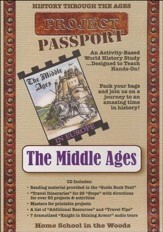 Designed to provide activities and encourage personal research, use them to accompany any Bible or history program you are using! The history of holidays is a fascinating subject in and of itself, and a fantastic way to incorporate some educational value into your fun celebrations! 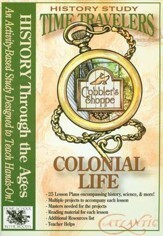 This CD-ROM features over 30 projects, games, recipes, links, texts, and other fun ways to celebrate. Each holiday's materials may be covered in 1-3 days. Elementary Grades. Windows and Macintosh Compatible, Adobe Acrobat Reader required.